Picture for illustration purposes only. PF % and quantity dependant on which product you order. Please read the description. Trays not included. Whiten your teeth the fast, safe and easy way. 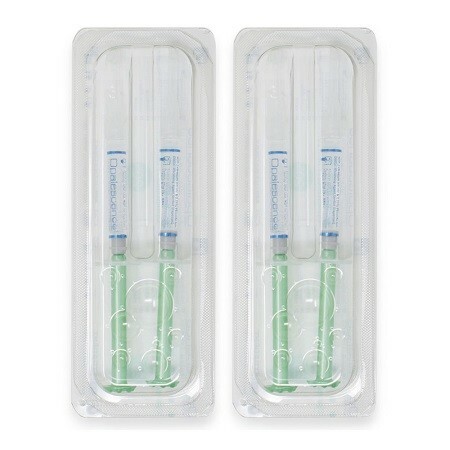 Opalescence Mint flavor syringes is the first ADA accepted, syringe delivered, take-home bleaching gel. The patented formula has sticky, adhesive properties, which produce results in days rather than weeks. Opalescence® tooth whitening system safely bleaches your teeth to lighten discoloration caused by food, coffee, tobacco, aging and other sources. The active ingredient in Opalescence, carbamide peroxide, has been recognized by FDA for many years as an oral antiseptic and is now used for its superior tooth whitening properties. Opalescence is available in a variety of carbamide peroxide concentrations to whiten even the most difficult stains. If you experience any significant sensitivity, stop your treatment and talk to your dentist. Opalescence is recommended for whitening discolored teeth prior to placement of composite, veneers, and/or crowns. It is effective in removing some or all internal tooth discolorations due to congenital, systemic, pharmacologic, traumatic, etc., factors as well as aging. Contains Carbamide peroxide, potassium nitrate and fluoride. Use no more than 1/3 to 1/2 of the syringe per tray. Brush teeth before inserting tray. Lightly tap tray to adapt sides to teeth. Unless directed otherwise by your dentist, wear Opalescence 10% for 8–10 hours or overnight, Opalescence 15% for 4–6 hours, Opalescence 20% for 2–4 hours, and Opalescence 35% for 30 minutes. Please view full instructions here.